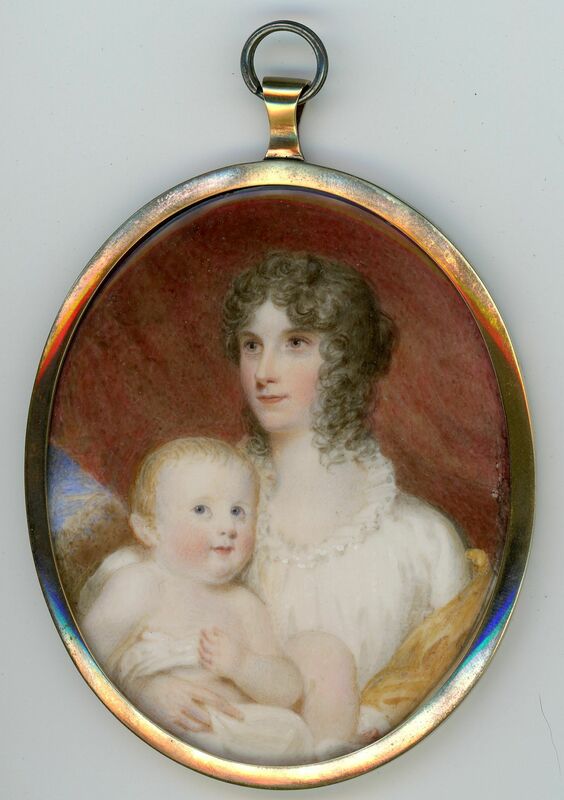 This double portrait depicts Mrs Charlotte Beaufoy as a young mother with her bonny baby son, believed to be John Henry born in 1789. 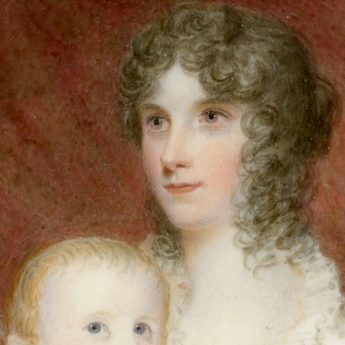 Shown before a red drape with a hint of a landscape view beyond, Charlotte is seated wearing a white dress with a gold-coloured wrap over her arms. Her brown hair is drawn back in a knot with long curls framing her face. 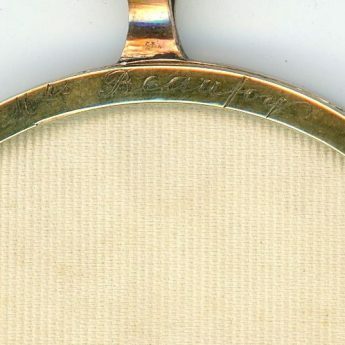 Charlotte was married to John Hanbury Beaufoy as his second wife. The Beaufoys were Quakers and had a vinegar brewery in South Lambert which John Hanbury assumed control of in 1820. In 1800 they acquired Upton Manor near Basingstoke as their family home. The property is now owned by the National Trust though it is not currently open to the public. 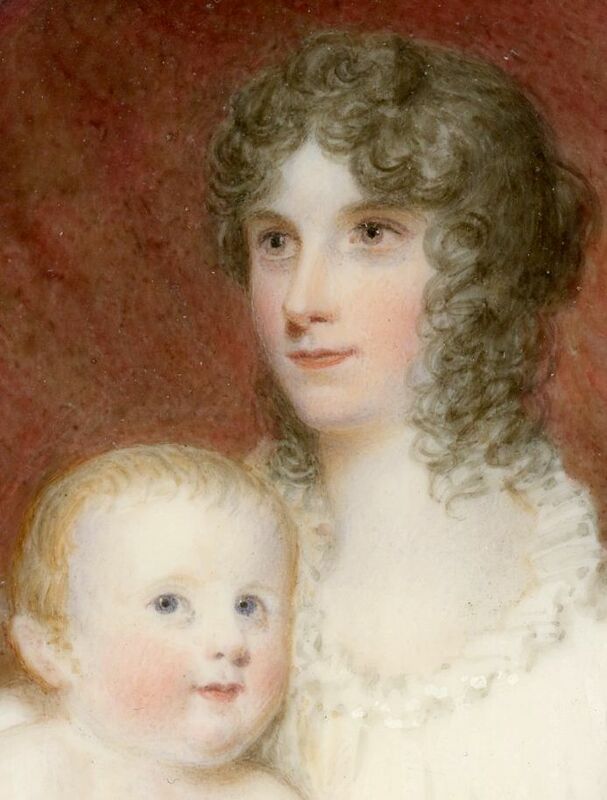 The couple’s eldest son, John Henry, is depicted here as a baby. He joined the 7th Regiment of Royal Fusiliers and was killed, aged nineteen, at the Battle of Talavera in 1809. There is a marble plaque erected in his memory in Upton Grey parish church by ‘his afflicted father’. The portrait is set in a gilt metal frame that is glazed on the reverse to reveal cream silk. 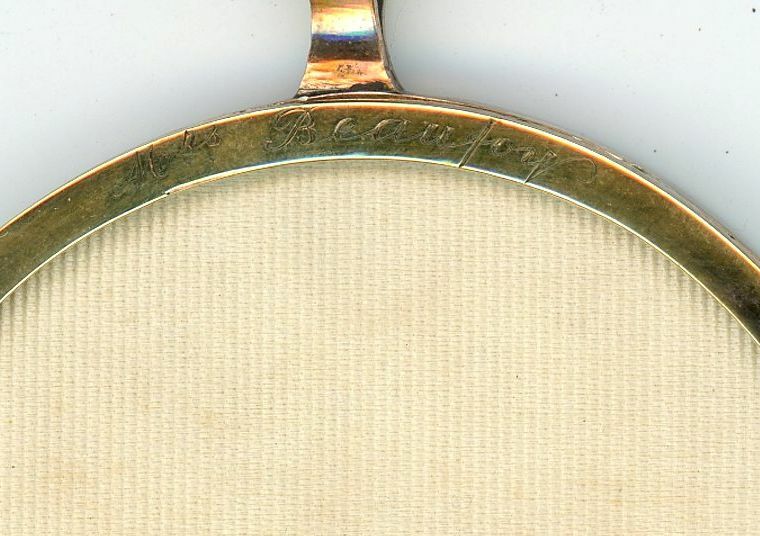 The frame is engraved ‘Mrs Beaufoy’ on the reverse. There is slight rubbing to the paint on the outer edge at 3 o’clock but otherwise the portrait and frame are in fine condition. Self-taught, Samuel Shelley entered the Royal Academy Schools at the age of seventeen and exhibited widely between 1772 and 1804. 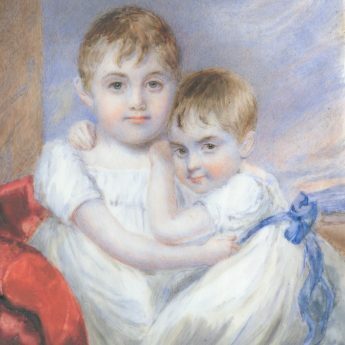 He is well noted for his miniatures of children and ladies and is said to have particularly enjoyed painting group portraits.